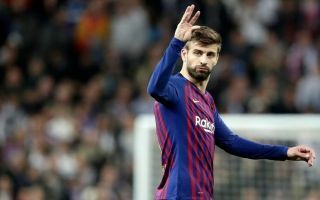 Barcelona defender Gerard Pique has explained the gesture he made to Real Madrid’s fans during El Clasico last night, tempers flared on the stroke of halftime. 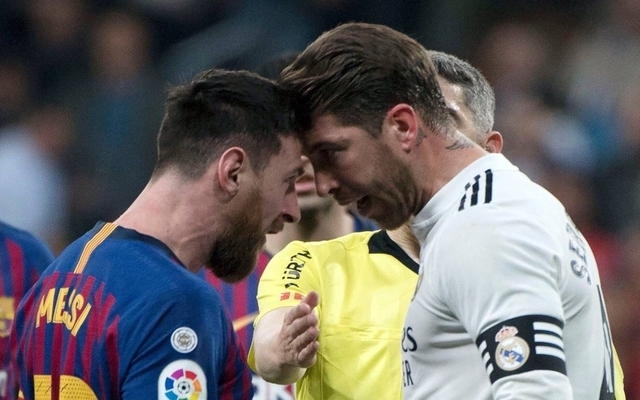 Pique made a mouthing gesture with his hand to Madrid fans at halftime, his gesture was made in the aftermath of Sergio Ramos’ elbow on Lionel Messi – which turned out to be one of the major talking points from the clash. Even Jose Mourinho weighed in on the incident, take a look at what he had to say here. According to Mirror Football, Pique believes that Ramos’ elbow “seemed like a red card to him”. The elbow sparked a head to head clash from Messi and Ramos. Messi looked like the angriest he’d ever been in his career after the clash. “Leo had blood on his lip. It was aggressive [from Ramos] and it seemed like a red card to me. “With the gesture, I was referring to the fact they talk [about referees and VAR] but sometimes things go in their favour. “Pulses are racing at 1,000 miles an hour and it was just a general gesture. I don’t regret it, it was how I felt at that moment. I like it when the atmosphere heats up and [the gesture] was to get it going a little bit more. Yesterday’s win was massive for Barcelona, as well as extending their lead at the top of La Liga to 10 – the Blaugrana have now pipped their rivals in the head to head rankings between the teams.